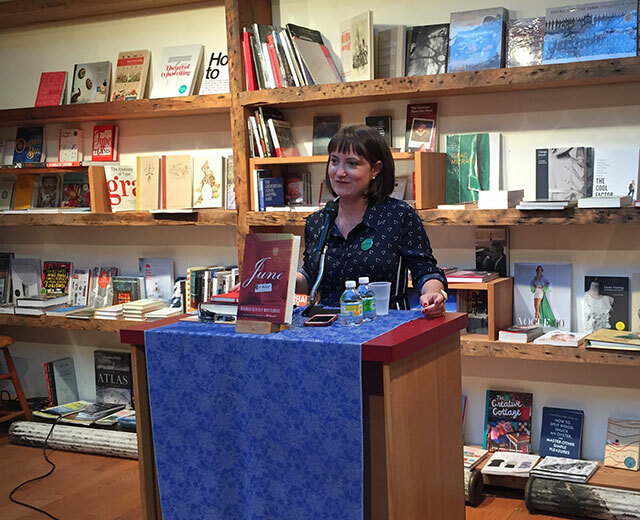 Miranda Beverly-Whittemore was at BookCourt last month to present her latest novel, June, about a family’s mansion in rural Ohio. The novel spans two time periods, 1955 and 2015, and revolves around family members hoping to understand a somewhat mysterious recipient of an inheritance. Although June is Beverly-Whittemore’s fourth novel, it was a book that almost didn’t happen, as she told Brian Gresko at LitHub. After her first two novels, she experimented with less traditional narrative structures and editors were disinterested with high risk work. People told her that her literary career was over. Two years ago she bounced back with the commercial-friendly literary novel Bittersweet. Beverly-Whittemore explains that the inspiration for the novel comes from an actual family mansion a relative of hers built in rural Ohio. She describes the house as crazy, and although it is right in the center of town, she wouldn’t want to live in rural Ohio. Writing a book about the house was one way of experiencing it without having to actually live in Ohio. Unfortunately, Lindie presented fundamental problems with the structure because Beverly-Whittemore didn’t believe that the girl would tell the story. Last summer the perspective shifted from a first to third person point of view. The character of June is unlikeable in many ways, Beverly-Whittemore says. Writing from the third-person perspective allowed for an exploration into her inner self. Letting the reader see into June more meant she came off as less cold and stiff. At the center of the novel is the old house. It exists in both timelines of the novel. “I think I just love writing about place,” she said. Writing about places that you love is more moving. In the case of the house in Ohio, she felt a connection to it. “I wish I wanted that life but I don’t,” she says. Because the house exists in both time periods, it helped with the transition between the two. The house itself only required description only once. Pieces of the house could be seen through time, like a yellow couch that first appears in 1955, and then returns later in the book. The biggest challenge of two time periods is keeping it from getting too complicated and the house helped anchor the reader. Transitioning between time periods brought into discussion the legacy of family, the town and the nation. The town in the 1950s was busier and had more bustle than it does today. The sleepy town today is not that enough happens to write about it, even if Beverly-Wittmore had fallen in love with the idea of the place.